The FabSpace 2.0 project today launched its international network expansion with 15 new FabSpaces located in various countries worldwide during the ESA Earth Observation Φ-week which is held on the 12th – 16th of November 2018 in ESA-ESRIN, Italy. The Φ-week event (http://phiweek.esa.int/) is organised by The European Space Agency (ESA) focusing on EO Open Science and FutureEO and aimed to review the latest developments in Open Science trends and kick-start innovative activities of the recently created Φ-department looking at FutureEO, and its associated Φ-lab aiming to identify, support and scale bold EO ideas. The 15 new FabSpaces complement the existing 20 FabSpaces and will help consolidating the FabSpace 2.0 project’s mission all over the world, disseminating the services and helping to address the needs of final users of Earth Observation and geodata-based applications. This year international expansion is the continuation from the last year first expansion and had achieved the FabSpace´s goal to be extended worldwide. “It is so exciting to think that the 6 founders FabSpaces and the 14 new FabSpaces that joined in January 2018 – half of them being now open – are now welcoming in November 2018 the 15 extra new FabSpaces! We can now be confident in the expansion and the sustainability of the FabSpace 2.0 international network on a global scale”, said Josiane Mothe from University Toulouse III – Paul Sabatier (UPS), the Coordinator of FabSpace 2.0. The application opening had started from July this year and the selection process took place on October. After going through a selection process, the consortium and the External Advisory Board of FabSpace 2.0 selected 15 new FabSpaces to contribute in highlighting the achievement of European space programmes and thereby European space data and broadcast a standard to foster open innovation in Universities 2.0 and possibly develop new applications and services enabled by space related data. Kyiv FabSpace (Ukraine) – EOS Data Analytics Kyiv, Institute of Agroecology and Land Management, National University of Water and Environmental Engineering Ukraine. Marcello Maranesi from University of Rome Tor Vergata, leader of the FabSpace 2.0 network dissemination said “During the application opening Aurélie Baker (from Aerospace Valley) and myself actively interacted with Universities from several countries for better introducing the FabSpace 2.0 concept and approach and we also learned a lot about their activities and future plans, so we are now ready to start working with them”. In addition to the launching of the network, FabSpace 2.0 founders are mentoring the FabSpaces networks and providing assistances and technical supports in implementing the platform and activities under FabSpace framework. Figure 2. 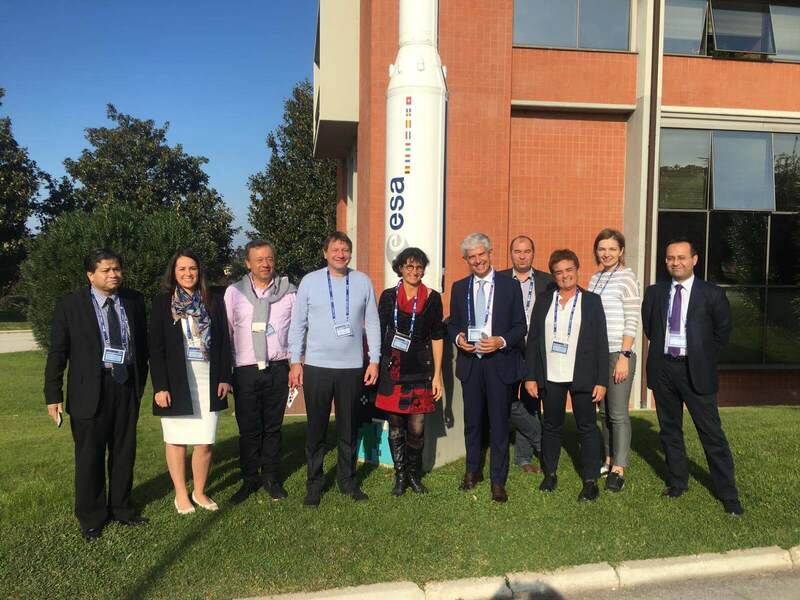 FabSpace Founders and New FabSpaces at the ESA Earth Observation Φ-week in ESA-ESRIN, Italy. From left to right: Fabspace Bangladesh/Chittagong – Mohammad Shahadat Hossain; Fabspace Toulouse – Jhoana Benavides; Fabspace Colombia/Bogota – Jose Fernando Jimenez Vargas; Fabspace Toulouse – Philippe Lattes & Josiane Mothe; FabSpace Italy – Marcello Maranesi; Fabspace Belgium – Antony Bievelez; Fabspace Italy/Cagliari – Maria Teresa Melis; Fabspace Ukraine – Nataliya Borotkanych; and Fabspace Romania – Mihai Ivanovici. Each new FabSpace is expected to offer a “Space Science Shop” service, that collects the needs and the societal challenges of external stakeholders (Civil Society Organisations, Public Authorities and Companies), linked to application domains of EO and satellite navigation uses (i.e., Agriculture and Forestry; Energy; Environment and resource efficiency; Intelligent Transport Systems; Smart cities; Health and well-being). The scope is to provide independent participatory research support in response to concerns experienced by external stakeholders, offering a demand-driven and bottom-up approach to the FabSpace facility and screening questions provided by these stakeholders. The FabSpace 2.0 network is also organising activities such as Open Days, Innovation Events (e.g. Hackathons, Start-Up Weekends, App Camps), workshops and conferences, bootcamps and many other open events as part of the project. The new FabSpaces are welcome to replicate them in their country/region and participate to the FabSpace 2.0 European innovation events and contests. Additionally, they can participate in the bootcamps organised by the other FabSpaces networks. 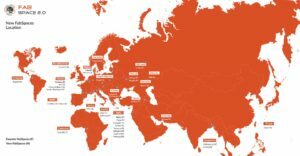 In addition, FabSpace 2.0 had selected 29 new FabSpaces until 2018 located in various countries worldwide including Armenia, Austria, Bangladesh, Belgium, Cameroon, Czech Republic, Cyprus, Colombia, France, Greece, Italy, Lithuania, Poland, Romania, Spain, Taiwan, The Netherlands, Tunisia, and Ukraine. These new FabSpaces expanded the FabSpace 2.0 network from its first founder FabSpaces in France, Belgium, Germany, Italy, Greece, and Poland.